New books out this October! We’ve got a couple of fantastic editions of We’re Going on a Bear Hunt out this month. The classic chant-aloud story by Michael Rosen and Helen Oxenbury if perfect in a new board book edition, and you can bring the story to life as a pop-up adventure in the new Pop-up book! We're Going on a Bear Hunt with Channel 4! Brave Bear Hunters break a GUINNESS WORLD RECORDS™ title! Books About Town BookBenches come to life! Michael Rosen and Helen Oxenbury shed some light on the origins of We’re Going on a Bear Hunt in this video interview on the Guardian, and explain how the book could have looked very different had Helen not ignored Michael’s original ideas. Watch the video below, or on the guardian.com. We kicked off our 25th anniversary celebrations with a launch party at Southbank Centre, where we ate way too much cake! In our defence, bear hunting is hungry work. Here are just a few pictures from the event. 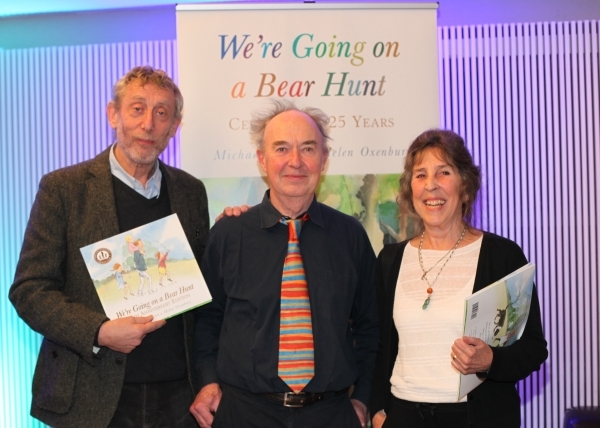 Michael Rosen and Helen Oxenbury celebrated 25 Years of We’re Going on a Bear Hunt with Simon Mayo on his BBC Radio 2 Drivetime show. It includes a fantastic reading of the book and is well worth a listen!